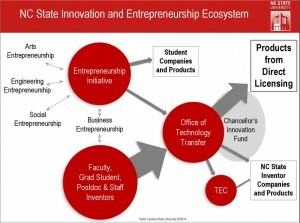 The Entrepreneurial Initiative – This is the big umbrella that houses many of the campus-wide entrepreneurial programs at NCSU. Among other things the EI offers the Silicon Valley trip every spring and the local entrepreneurs tour every fall. The EI also sponsors the ELS (Entrepreneurs Lecture Series). The eGames – Another offering from the EI is an entrepreneurial competition every spring that gives away tens of thousands of dollars to entrepreneurs on campus. The Entrepreneurs Village – If you want to live an entrepreneurial lifestyle, the Entrepreneurs Village is an immersive dorm experience for entrepreneurial students. The Garage – A campus-wide facility open to all students with entrepreneurial aspirations. The Garage contains prototyping tools like 3D printers, laser cutters and wood-working tools, office space, meeting space, video production facilities, etc. Services are free to students who become members of the Garage. The Hunt Library Makerspace – 3D printing, laser cutting, poster printing, etc. are available in the Hunt library on a for-fee basis. The Hunt Library Game Lab – If your startup is developing games, you may be able to test them here. See also other technology opportunities including the creativity studio, the usability lab, the media production studios, the visualization lab, etc. The College of Design Materials Lab – If you can get access to it, the woodworking and metalworking facilities in the College of Design appear to be the most extensive available on campus. NCSU VentureBoard – A directory of many of the entrepreneurial students and companies on campus. The Engineering Entrepreneurs Program – The EEP gives seniors in the College of Engineering an alternative to their department’s senior project in the form of a two-semester entrepreneurial track. Students form teams and start with a blank sheet to paper to create an entrepreneurial company and product. EI General Education Classes – EI201 (Exploring Interdisciplinary Entrepreneurial Thinking) and EI331 (Interdisciplinary Entrepreneurial Thinking I: Skills and Planning Basics) are university-wide classes that offer an introductory entrepreneurial experience. Minor in Arts Entrepreneurship – A five-course series that leads to a minor in arts entrepreneurship, housed in the Music department under Gary Beckman. Example. The Institute for Nonprofits – Supports research, education and engagement in the area of social entrepreneurship. The Center for Student Leadership, Ethics & Public Service (CSLEPS) – Connects NC State students who are passionate about making a positive impact on the world to a wide variety of approaches to service including social entrepreneurship. Through CSLEPS, students can connect to LeaderShape (open to students who still have at least one more year at NC State) and The Clinton Global Initiative University (open to all students). These programs support students who are developing compelling visions for change and also provide access to resources (including funding) to help them implement their projects. The NCSU Small Business Technology Development Center (SBTDC) – A description from the website: “Our experienced business advisory team offers confidential, in-depth business counseling to mid-sized company business owners and management staff.” They can also provide assistance to entrepreneurs in some cases.